Raise your hand if this has happened to you: you see a blog post for a body scrub that looks amazing and would be totally budget-friendly…if you had all the ingredients. But then there’s those odd ingredients you don’t have on hand like witch hazel or essential oils. While either of those things would be worth the initial investment, this body scrub recipe is ready-to-go, requiring only three ingredients that you most likely already have in your kitchen cabinet. Add brown sugar and cinnamon. Stir thoroughly. That’s it! Depending on the size of your container, you may need to make more. Just keep the ratio of honey to brown sugar the same. 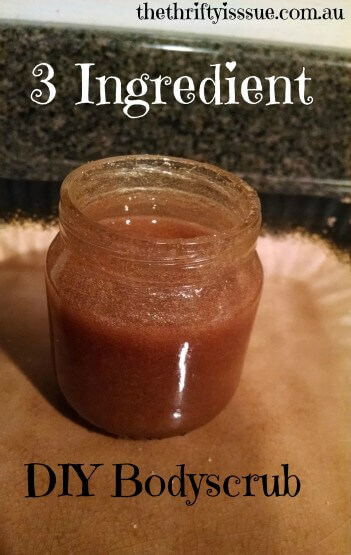 For example, if you wanted to double the recipe it would be 1/2 c honey with 2/3 c brown sugar. If you don’t like the consistency, add a little more brown sugar for a rougher mixture or a little more honey for something smoother. After some trial and error, this ratio gave me my favorite texture. The cinnamon just adds another element to its aroma, so start with a pinch and add more if you feel like it needs it. My husband gave me an odd look the first time I whipped this up. “Are you sure this is a good idea? Aren’t you going to get all sticky with all that honey?” It was a valid concern, but everything turned out great. It washes off easily, exfoliates, and leaves my skin soft and fragrant. All of this for pennies on the dollar. I like to use my exfoliant/body scrub in lieu of shaving cream. I have extremely sensitive skin on my legs and often get razor bumps. But not when I use body scrub. I exfoliate the area I want to shave first, then rinse. Immediately after I use my regular old razor for a smooth shave without those annoying red marks left over. I apply lotion after I get out of the shower in downward movements in the same direction as my hair would normally grow, and I’m good to go! So go to your kitchen. 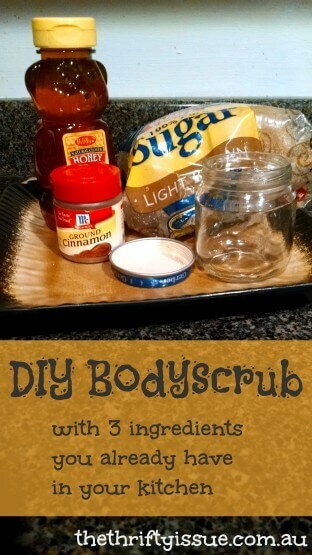 Make some body scrub in five minutes. And never buy body scrub or women’s shaving cream again.